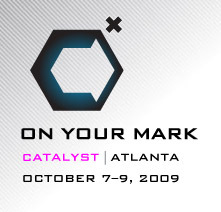 Catalyst Atlanta, 2009 is now over. It was my first time to attend, so that means I missed the first 9. I wish I had heard about it sooner than last year. I arrived on Wednesday for their lab day. A fancy way of saying small seminars. I wasn’t sure what I was doing, where I was going or if I knew any one. I “registered” and entered the lab area. A place far too small for the thousands that were there. We started with a general worship time in an overly crowded hall, then we distributed ourselves into smaller seminar rooms that were, well, over crowded. For one session I found myself outside the doors in a hall standing and listening (as best as I could) with several dozen people. Overall, I learned a lot but never saw anyone I knew. I did meet a few Pastors/leaders that also looked lost — nothing was clearly defined. Near the end of the day, I finally introduced myself to someone else that was by himself and we developed a friendship over dinner and into the next few days. Wow – Everything was well done. They had lots of volunteers to help and direct, and they created energy and excitement. There were helicopters buzzing us overhead while we waited for the doors to open and I was standing next to a petting zoo (near the missions/outreach area). There were balloons and live bands. The theme of “On your Mark” was emphasized (which makes my branding heart proud!) — by large graffiti-styled boards available for people to write on. Also, volunteers wandered around (all in white) allowing people to sign (make their mark) all over them! Once inside and finding a seat, the entire auditorium was candle-lit and you could feel the energy everywhere. Weirdness – OK, Catalyst median age would probably be late 20’s or early 30’s — so they do a lot of “fun” things that keep it interesting! Such as surprise “marking” the emcee with a permanent tattoo right on stage, handing out “My name is Mark” shirts to all the Marks in the audience, showing crazy funny (that will leave a mark) videos at the breaks, breaking a “diving into 12 inches of water from a 36 foot tower” world record, having 13,000 confetti shooters go off all at once, a football free-for-all (we all got a football to throw) and on and on it goes. It was a nice refreshing way to break the sessions up and get the crowd energized. Worship – This was overall feeling from the conference. The Praise and Worship bands that led us were amazing. We had communion (yes, with 13,000!) and we were led to gaze on the face of Christ. The preaching/teaching was world class with Bell, Swindoll, Stanley, Gladwell, Chan, Dungey and more that I can’t remember right now. There was really only one person I didn’t enjoy. They (for the most part) reminded us that in all we do, keep our eyes fixed on Christ. Amen! There was also leadership and management advice but given from a Christian-world view. There’s so much more I could write. Will I return? Absolutely! However, I’ll probably pass on the Lab day — but I’ve just written the dates on my calendar for next year! Oct 6-8, 2010. I hope to see you there!